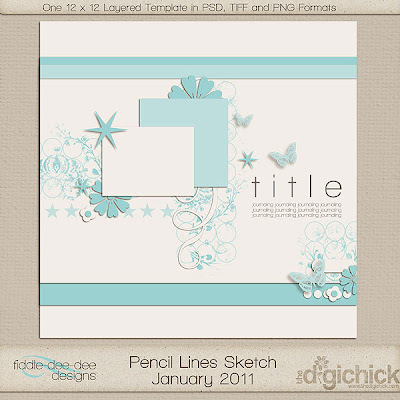 Fiddle-Dee-Dee Designs: Pencil Lines Sketch/Template Freebie & Chance to Win a Set of Templates! Pencil Lines Sketch/Template Freebie & Chance to Win a Set of Templates! I am so pleased to announce that I am this month's sponsor at the Pencil Lines Sketch Blog. This week you'll find Sketch 221 designed by me that you can download for free right here (template no longer available for free ~ you can find it my shop at The Digichick). Please be sure to play along in the sketch challenge as your entry places you in the running for a free set of templates from me. You'll just need to post a link to your layout on the Pencil Lines Sketch Blog under the Sketch 221 post here: Pencil Lines Sketch 221. I hope you enjoy ~ and as always ~ sending you wishes for much happy scrapping! (image is linked to Box.net) ?? I don't think it is linked yet. I would love to play with this! Love it! I posted at FS! Thanks! This was SO fun....thanks! :-) I'm going to post right now!